Stripes and plaids are iconic pattern designs that have the magic ability to bring a tinge of class to any outfit. When using striped or plaid fabrics for Rue, there are almost endless possibilities for playing with the direction of the design and the drape of the dress. I thought I’d invite you all to my little stripes and plaid party! I put together a few variations in fabric and direction on Rue’s technical drawings. I’ve also compiled a collection of tutorials and articles that teach you how to sew with plaids and stripes, to help you plan your dream version of Rue. In a small stripe, verison 1 of Rue has a very tailored, classic look. 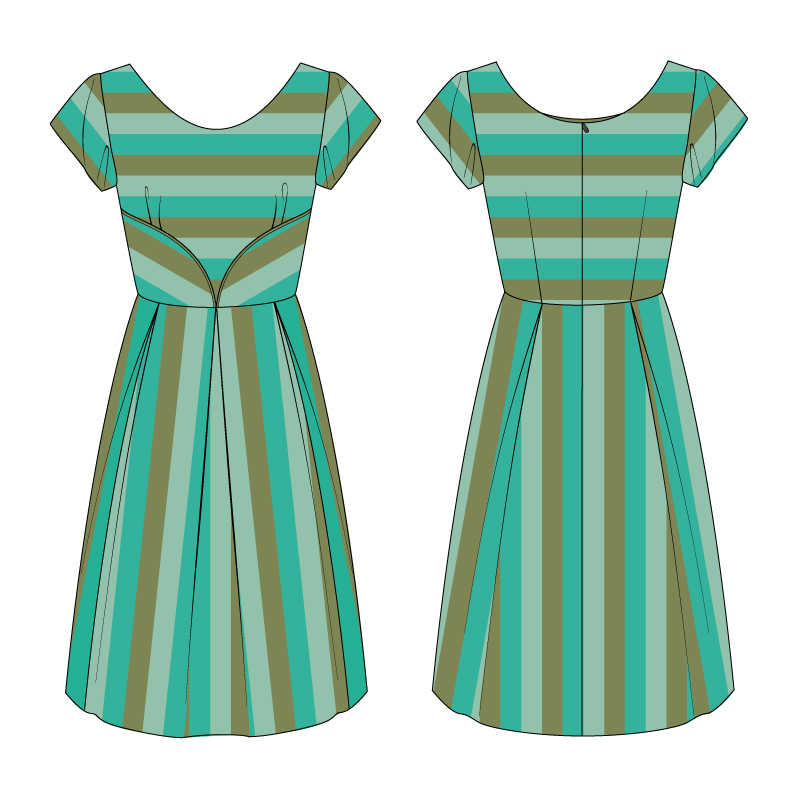 On almost every pattern piece the stripes are horizontal, aside from the side front bodice. The change in direction on just that one piece helps the entire style line of the bust stand out. Version 2 in the small stripe is the opposite of version 1, with almost every piece cut vertically except the side front bodice. Because version 2 is a much straighter silhouette, the vertical lines give an illusion of length to the dress. This would be a great idea for a more petite person that would like to elongate their silhouette. 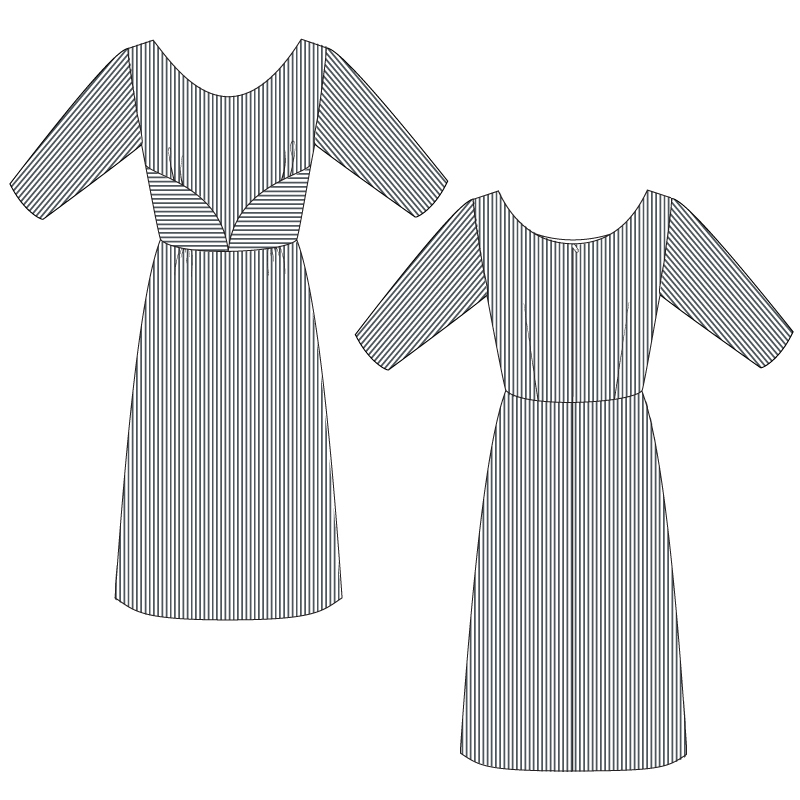 On this illustration, the side front bodice is on the bias, the front bodice is horizontal, and the skirt is vertical. This mismatch of direction works well in a larger stripe but may be too busy in a pinstripe. I’ve always been a sucker for chevron skirts. Fads come and go but, my excitement for a bias cut, chevron skirt will never fade. Version 2 in the big stripe has a horizontal bodice, vertical sleeves, and a bias skirt. To create this chevron effect, simply add 5/8″ seam allowance to the fold line on the skirt front piece. Cut from this line rather than placing the pattern on the fold. I had to mock up at least one illustration in which we followed all the rules. This version 1 of Rue is made with all pieces cut on grain. Funnily enough, Farrah, who made these illustrations, liked this one the most! It’s a bias explosion! On this version 2 of Rue, the plaid is bias cut on the entire bodice and skirt. I’m not sure how crazy I am about this one. I think the seam line down the center front of the bodice is distracting. But, if the plaid wasn’t such a square plaid, I may feel differently. Bias: Bias cut pieces will have a much different drape to them versus pieces cut on the cross or straight of grain. Keep this in mind when planning out your overall design. Staystitching and hanging fabric before cutting is absolutely essential in order for your garment to turn out nicely. You can read about more tips for cutting on the bias in Haley’s “Guide to Working on the Bias” article in Seamwork Magazine. Crossgrain: The Crossgrain is perpendicular to the grainline of your fabric. In a woven fabric, the crossgrain has a bit of stretch, which allows for some wiggle room in a garment. When cutting pattern pieces on the crossgrain, you will not have any stretch along the circumference of the body. Make sure that your pattern has enough ease to allow for movement without relying on the bit of stretch it was designed for. Because the crossgrain will stretch and you might end up with a longer piece than you intended, I suggest hanging your cut pattern pieces on the crossgrain for a good day or two before sewing, to let gravity do some pre-stretching for you. 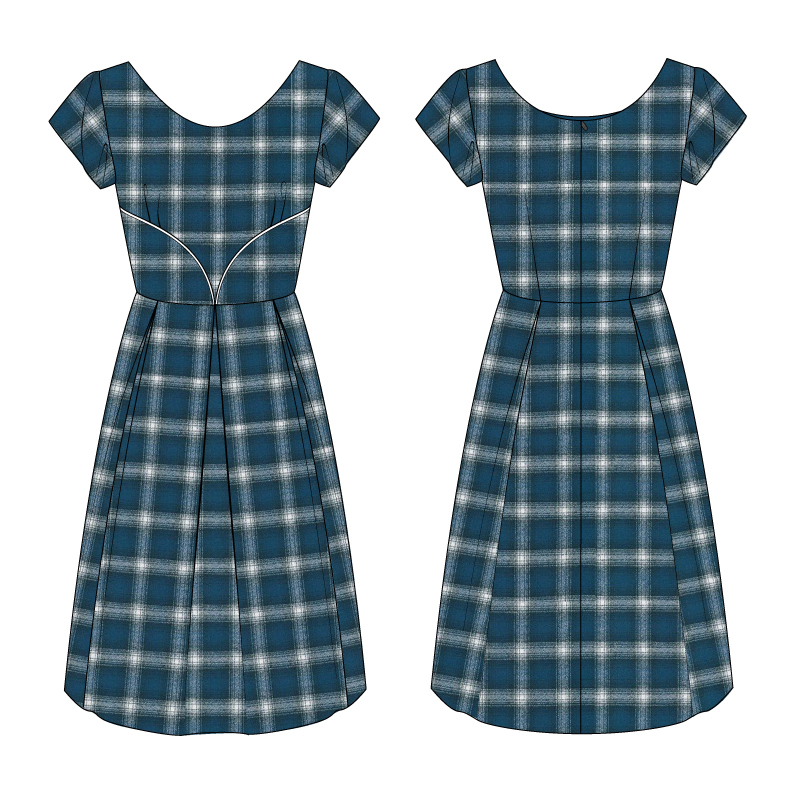 If just the skirt is cut on the crossgrain, you can sew up the dress right after cutting and hang before hemming. Take the guess work out of matching prints with tips, tricks, and three matching techniques in the “How to Match Plaids, Stripes, and Large Prints” article in Seamwork Magazine. 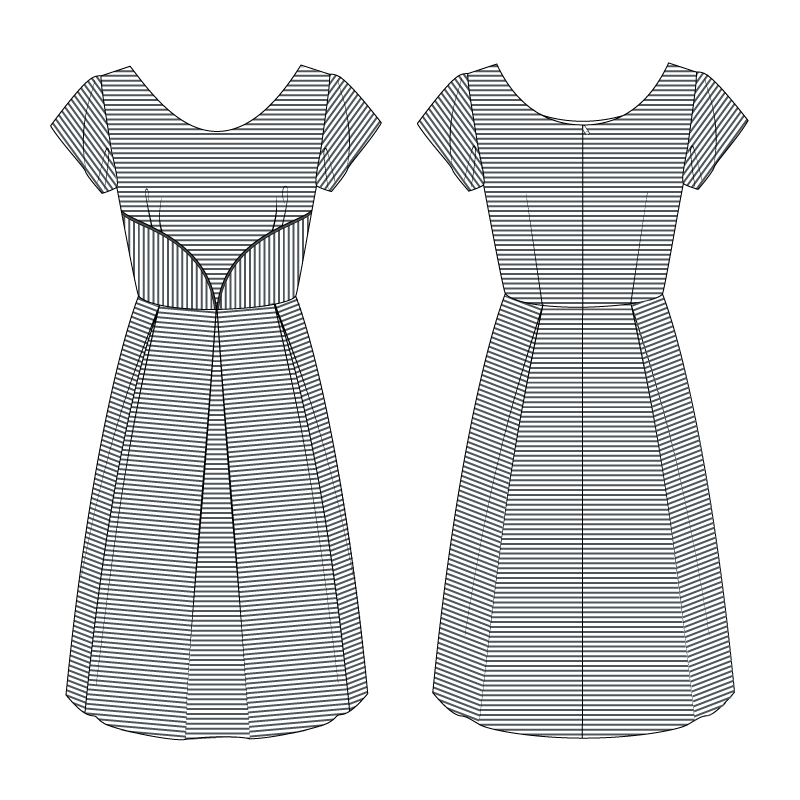 Learn to “Match Stripes like a Pro” in Jenny Rushmore’s Seamwork article. “A Guide to Working on the Bias” by Haley for Seamwork Magazine. Step-by-step instructions for creative plaid matching by Sarai. A tutorial from way back in 2011 on How to Match Plaids and Stripes. I’m always so excited when I see other creative use of stripes and plaids that I never even thought of. Do you have any fun stripe or plaid plans for your Rue? 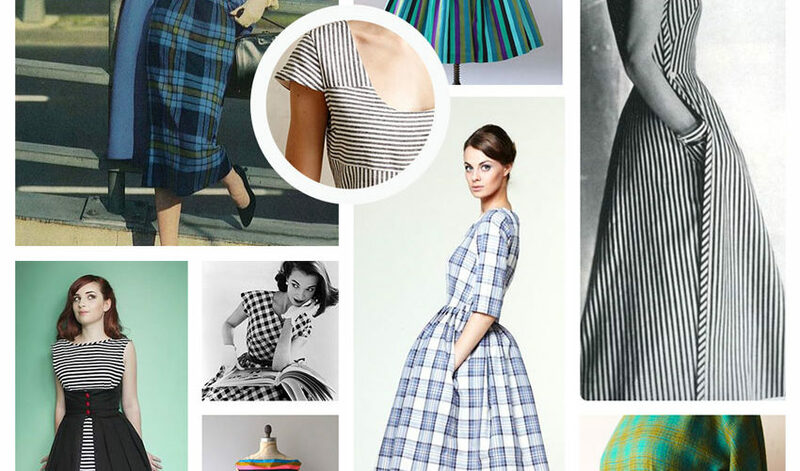 What successful or not-so-successful experiences have you had sewing with stripes and plaids? Thanks for the great mini-tutorial. Especially enjoyed the comment about cutting on the crossgrain. While not related to stripes or plaids, I just wanted you to know I have a better sense of what happened the last time I salvaged a short remnant into a pair of pants by cutting on the crossgrain, which worked great, but explains why they somehow felt more constricted. Now I know why! It is a good way to make total use of a small piece of fabric, as long as the design accommodates the small difference in stretch. Using a non square plaid on the bias will make you insane (as well as queasy). The skirt would be fine as one piece on the bias, which would only need matching on the side seams (you might have to cheat the side seams out a little). The key is patience and extra yardage and wide seam allowances for the teeny tiny adjustments that will make the lines match up perfectly. Thanks so much for this! I love plaids and stripes and lots of effects are possible with these kinds of variations.